"What is the main use of Easy Link Connectors on Manfrotto tripods? I am moving over from Pentax M3 and ME super film cameras to a Pentax K-70 digital camera. What accessory do I need to operate the K-70 remotely. Is there a specific article or book on the accessories for the Pentax range that you recommend? Thanks for your question. These are questions that would be better answered by someone with very specific knowledge on these connectors, as well as Pentax K-70 cameras. I have no experience with either. The Manfrotto Easy Link Connectors from are a pair of aluminum connectors designed to attach a variety of accessories to Manfrotto Easy Link and Sympla supports. 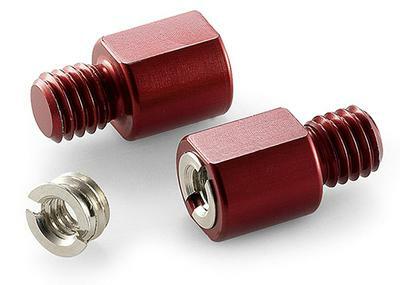 Each one has a female and male 3/8"-16 mounting thread and also has a 1/4"-20 bushing adapter to attach accessories gadgets that have the smaller thread size. When you use the connectors you can attach accessories to your tripod or tripod head that has an Easy Link Monitors, microphones, magic arms, LED lights, transmitters, etc. The connectors also work for bridging Sympla plates and Manfrotto heads.